As an extra little “thank you,” we will also provide everyone who completes the survey with a discount code for the upcoming MarTech conference in Boston, October 2-4. Please. Take 10 minutes to contribute to this survey now. Thank you!! P.S. The marketing org chart shown at the top of this post is an amalgamation of several of the common structures that I’ve seen recently. But this Marketing Organizations in the Age of Martech study will give us a lot more real-world data on the different structures being used. Previous Post Is marketing technology entering a post-platform era? 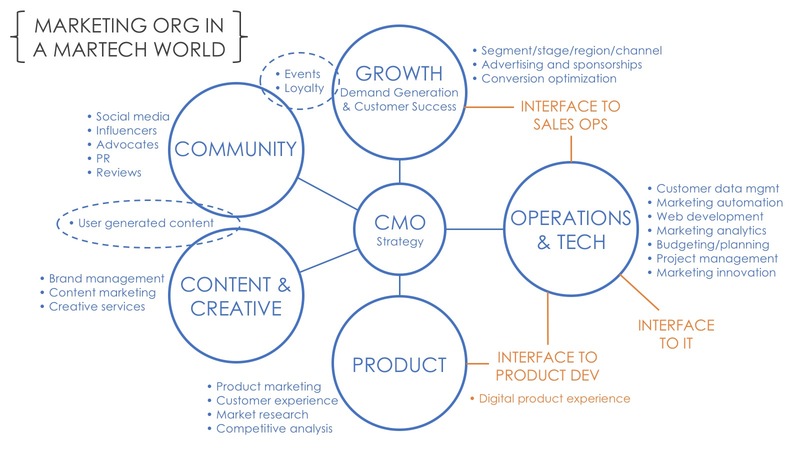 Scott – Love the orgchart–I’ve been working to define roles for a new marketing organization, and ultimately decided on hires that match the Growth, Product and Creative/Content. WIth limited headcount, operations & headcount roll into the Growth role, and Community rolls into Creative/Content. I also envision some cross-training and tech responsibility for everyone in the organization–everyone should be able to view analytics and build programs in marketing automation relative to their roles. The challenge I see after taking the survey is twofold. First, for smaller organizations, how best to prioritize activities. The marketing ops role isn’t a department with multiple staff–its one person. 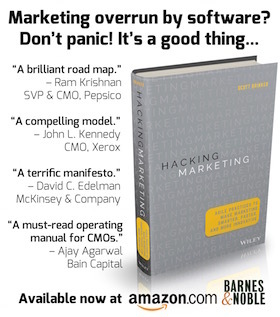 Of all activities in the emerging Marketing Ops role, how do you prioritize? Second is related–building the overall team–which sequence of hire makes most sense. If you need a content person and a growth person, do you bring the content person in first so the content supply is assured, or do you bring in the growth person first to work on optimizing lead-to-revenue management ahead of content ramp. I’m looking forward to the results of the study. Excellent work! I have participated in the survey and am looking forward to the shared results of the survey. It would also be interesting to include the relationships of the CIO in the org charts and to hear if there have been Chief Revenue Officers and Chief Strategy Officers referenced in you findings and their relations as well.